Tomorrow is the big day! At early o’clock, I will be hopping on a plane to go train for my new job. I wouldn’t say I’m a nervous wreck, but my brain will NOT quit racing! One moment it’s “Yay, I’m so excited, this will be awesome!”…the next moment, “Oh my gosh, can I actually do this? Am I cut out for it? And I won’t get to see my hubby for a whole ten days!” Yeah. Naturally, those nervous, “can I do this?” thoughts tend to overshadow the excited thoughts. And I get stuck there, wondering if I will succeed in this new job, or if I will just embarrass myself. This is a huge transition. It feels like I’m stepping off of the well-worn road I know so well to a brand-new, unfamiliar place. My personality likes the predictable. And this is not predictable. In that moment, the Lord reminded me that no matter my situation – whether I’m comfortable or uncomfortable, confident or discouraged, in familiar territory or in a new place – no matter what – He will provide the strength I need for the situation. A concept I’ve heard many times? Yes. A good reminder? YES! So that thing you’re facing that seems impossible? That situation that makes you hyperventilate to just think about? 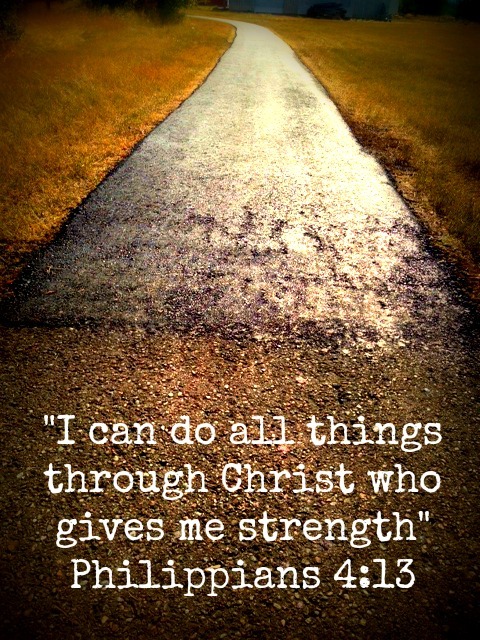 You can’t do it on your own strength – but you CAN do it on God’s. Posted in Challenge and tagged Bible Study, God, Spirituality, Strength, Transition, Trust. Bookmark the permalink.